Okay so you have had a look at the EA Color Wheel, you understand a bit of what it can tell you about what's going on inside you. Now it's time to put your understanding to work. The whole idea of a Color Wheel is the opportunity it gives you to look at some very important processes going on inside you. It helps you to look at not only what is happening but which of your tools or sub-personalities are trying to deal with your life and how successful they are. Some of these processes can be described in words and pictures, colour helps as well to separate the different energies and different kinds of processes, or as I like to describe them all, your “emotional tools” . This Color Wheel is designed to help you to work with your energies or feeling tools as well is with logic and word tools because you need both. It is really quite simple. Moving around your Wheel is a conscious process. Getting stuck in a zone is an automatic one. Here is how you make it more conscious. The more conscious you are of where you are on the Wheel the better things become. You’re developing your emotional age awareness EA. There are just four steps and you can start right now. 1. Recognise and name the four main systems, zones or energy states that are running inside you (and me and everyone else). 1. Very young and very vulnerable Pink sector plus the hard working, busy but emotionally young protector systems orange, red, yellow and dark yellow sectors, your PYRO zone. 2. Rational Analytical systems dark green, bright green and aqua blue-green sectors, your STAR zone. These four distinctly different energy states can each take it in turns to drive your actions, words, thoughts and feelings at different times of the day and in different situations. While they are doing this automatically your life will have lots of ups and downs. * Notice how often you shift in or out of these different states or zones on a typical day. This is explained in more detail below. Right now all you need to start using your Wheel to switch from automatic to manual control is what is explained here. * If you’re feeling lost, devastated, just too tired or just cannot cope, or you feel just don’t have the tools for the job or and no one will help you, then just now you are in your pink, Powerless INner Kid - very young and very vulnerable sector. * If you are thinking or feeling you must do something, such as pleasing someone to get that person to meet one of your important needs then just now you are in the orange sector. If you are feeling unfairly victimised and need someone to stop doing that to you then you you are in the needy orange sector. * if you are feeling angry about what was happening to you when you were stuck in the orange sector that means you have moved out of it and you are now in the red fighter-survivor sector. The same if you are fighting in any way that will help you to survive negative things someone is doing to you. That's the red sector. * If you are trying a bit too hard to get others to fix things that is a sign you have moved to the young fixer yellow sector. If you are putting pressure on other people to get things fixed that’s a sign that you have moved to the young Pusher Driver dark yellow sector and that usually improves your chances of success. * If however you have started to apply more thought and logic to what you are doing you have moved to the start of the thinking zone, the dark green STAR thinker-fixer. Notice the improvement when you apply logic to back up the pressure you are putting on people to help solve your problem or settle issues. This is a major step forward and a sign that you are moving out of the younger energy states above. * The more you apply rational, sensible, logical thinking to help you deal with life the more you are in the bright green sector. *After that everything changes as your self-aware grown up systems develop. When you notice this happening you are somewhere in your integrated and balanced blue WING sectors on the left side of your EA Wheel. 3. Notice that you have just noticed where you were on the emotional age Wheel. Congratulate yourself, because the more you do this the more you are consciously moving around the Wheel. How do you know it’s working? Because you just used it to switch from automatic to manual control. If you were truly stuck in the Pink sector you would not be able to do this. In the orange, red, and yellow sectors it will still be very difficult to notice where you are. 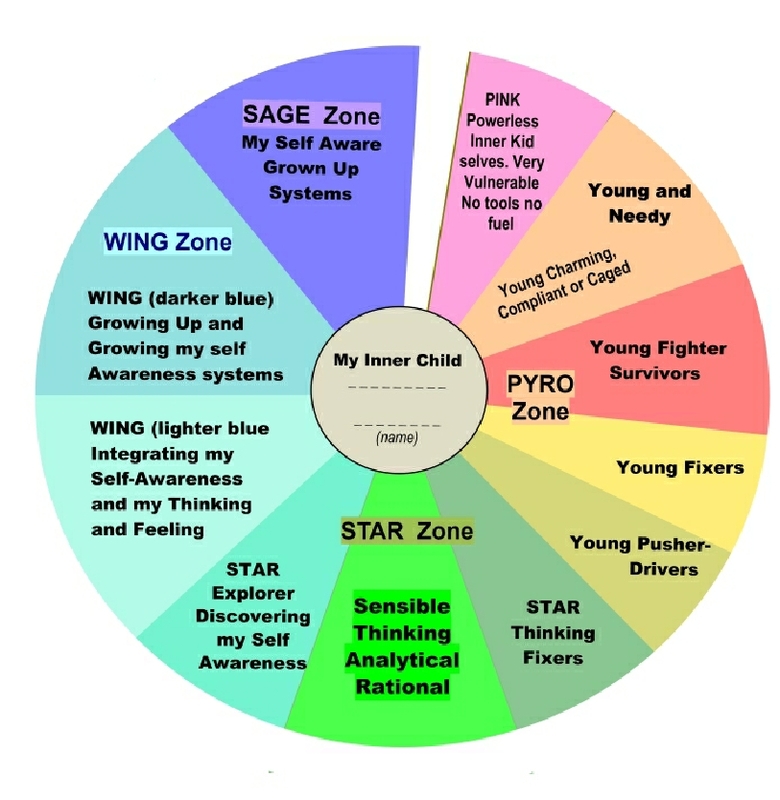 So, just by using your emotional age Wheel, to visualise which zone you were in, you were consciously moving yourself into either the dark green, bright green or blue sectors. They are the only parts of you that can be fully aware like this and you were able to move into those parts without any effort. It is a simple as that. Now you know that those dark green, bright green or blue parts are the ones that work best for you try to use them more consciously and more often. The more you do this the better your life becomes. Imagine the Wheel on your wrist like a watch. Glance at it from time to time to see where you are. If you feel stuck in the pink or orange or red sectors a quick look at the Wheel will help you to move consciously out of those into either your dark green or better still bright green or best of all blue and purple zones. 4. Remind yourself that moving around your Wheel is a conscious process. Getting stuck in a zone is an automatic process. That’s it. Now you know how to use your EA Wheel. The more you practice, the better it gets. Here is some more information about the different zones. 1. The very vulnerable child state - this has its own particular energy levels, thoughts and words and feelings which I describe as feeling stuck with enormous problems and with no tools and no fuel. (Pink ) As adults we can find it truly devastating when we suddenly find ourselves back in this state. But the moment you can recognise what has happened, you are on the way to moving out of it again. 2. The busy but emotionally younger protector systems with their drive and enthusiasm but still very young energy, have had reasonable success some of the time but often because they are just too young emotionally they don’t get things straight, the fixes they set up don't last. One common characteristic is that no matter which of the younger parts it may be or which emotional tools any one of these parts is using it always tries very hard to protect you to the very best of its limited ability. There are several different young protector systems you can see as you look at the EA Wheel. They are all in the orange, red, yellow and dark yellow sectors. If you think in terms of the work they do it’s as though they have some useful tools but the tools are just loose in a bag and these parts often pick out the wrong tool for the job. If they do happen to get the right tool they may not be very skilled at using it. They just do not have the emotional maturity to handle what is really “grown-up’s work”. You can help by recognising when these parts are trying to solve your problems and offering to let a more grown-up part take over. These are your amazingly sensible rational analytical thinking parts These parts of you (shown on the Wheel in dark green, bright green and aqua-green ) are well on the way to operating in a grown-up way and far better at problem solving and decision making than any of the younger sectors. Your rational mind to can ask the same questions above if you’re SAGE has not yet developed enough to ask them. It will be your rational mind that comes up with the answers. It as though your emotional tools are now stored sensibly and neatly in a box, making it easier to choose the right one for each job. Asking the same or similar questions serves the same important purpose of getting you to move consciously out of the orange, red, yellow and dark yellow sectors when you are faced with decisions to make or problems to solve, as grown-ups are. I hope that instead I am now talking to another part, the incredibly powerful and amazingly functional part described as your WING System. That's the part over on the left hand side, the two blue WING sectors on the left side of your EA Wheel. So the first step after quickly looking at the different parts of the Wheel is to discover how easily you can access your own inner Aware Grown Up WING System. (as you did at the top of this page) Once you know it’s there, and once you can recognise when you are in that energy state or not in it. In that energy zone you start by just becoming more aware, as you already are, that we all have a built-in Aware Grown Up system. From that point you just go on learning how to use it and how to let it take over the grown-up’s jobs that the younger parts have been struggling with the so long. 5. Finally you find yourself moving to the purple SAGE zone. There are some simple and straightforward techniques for strengthening your SAGE which I describe it in my new book “Flying Awareness”. I also be offer a condensed free version “Introduction to Emotional Age Awareness” which you can request by e-mail to bligh3@growingaware.com. Right now, ask yourself “Am I feeling very young and very vulnerable and scared about what I am trying to do?” or “Do I feel as though I am stuck in a place with no tools and no fuel ? or ”Do still I feel emotionally a bit too young and not terribly competent about what I have to do?” or “Am I using random tools from my tool bag without choosing the best ones for the job?” Am I expecting a part that is still too young emotionally to handle what is “grown-up’s work”. Or does it feel as though you are using your rational mind, your emotional awareness and your emotional tools are all sorted neatly in a tool kit instead of loose in a bag. You will also notice that you have a sense of balance as you integrate several different emotional tools to use together. The more you do this the stronger your SAGE becomes. The good news is that the part of you asking that question may actually be your SAGE at work asking those questions and each time you ask those questions you are strengthening your SAGE, because the more you use it the stronger it gets. The first run has sold out already but more are on the way. Introductory price $19.95 USD including postage to your address anywhere in the World. Delivery 14 to 21 days. Most of my clients use their mug as a way of checking where they are on their EA wheel. When they are stuck in PYRO a quick glance at their EA mug helps them move out of that troublesome zone.